This fall, St. Mary’s University welcomed 640 new freshmen — among the largest classes in University history and among the most academically gifted. The academic qualifications of incoming freshmen have continued an upward trend over the past few years. The average SAT score for incoming freshmen rose to 1168 in Fall 2018, which is a 3.5 percent increase since Fall 2015. The average GPA for incoming freshmen rose to 3.6 in Fall 2018, an increase of about 4.7 percent since Fall 2015. The number of students entering the Honors Program nearly doubled to 40 this fall as well. Alderman attributes the increase in academic qualification to the University’s “transparent, robust scholarship awarding process,” which helped students see what they qualify for at the time of admission. “We believe more students have applied because they can see the scholarship amounts they would likely receive with their academic record,” she said. 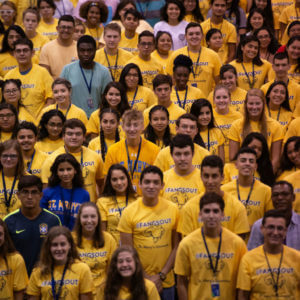 The incoming class also represents greater geographic diversity — including students from 21 states and Puerto Rico, as well as 15 countries. “The makeup of the class, especially when you’re talking about diversity of backgrounds, gives vibrancy to campus and allows for the educational experience to be much richer,” Alderman said.